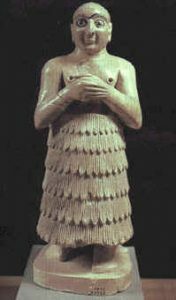 A statue of a worshipper from Mari, on the Euphrates river in Mesopotamia (modern Syria). Around 2900 BC, after the flood, comes a time period called Early Dynastic, which lasts for about 600 years (there is a good deal of disagreement). It corresponds to the Old Kingdom in Egypt and to the Early Bronze Age in Greece. The civilization of West Asia continued in more or less the same way as before. Between the Tigris and the Euphrates there were many cities, each laying claim to some of the land around it (and the people who lived on that land). Generally each city had a king, and also a high priest or priestess. Both the priests and the kings were very powerful, and they had to cooperate with each other in order to rule. Some of these kings wanted to get power over the other kings, so the city-states were constantly fighting each other. Sometimes one king really did rule over many cities, and the other kings had to do what he said. Sometimes kings claimed to be in charge, but really nobody listened to them. It is hard now for us to tell which is which. This is also the time when we first have real written stories about some of these kings. 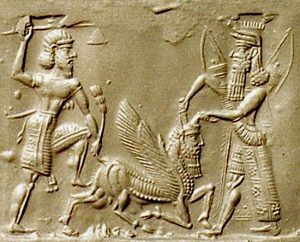 The most famous of these is Gilgamesh, the king of Uruk. Mesopotamia, by Pamela Service (1998). Down to the Persian conquest of the area. Ancient Mesopotamians, by Elena Gambino (2000). Retellings of Mesopotamian stories and lots of context. Ancient Egyptians and Their Neighbors: An Activity Guide, by Marian Broida (1999). Not just Egypt! Includes activities about the Sumerians, the Babylonians, the Hittites, and the Nubians. Cite this page: Carr, K.E. Early Dynastic Mesopotamia – West Asian history. Quatr.us Study Guides, September 14, 2017. Web. April 18, 2019.